At sixty-one, George Hall is settling down to a comfortable retirement. When his tempestuous daughter, Katie, announces that she is getting married to the deeply inappropriate Ray, the Hall family is thrown into a tizzy. Unnoticed in the uproar, George discovers a sinister lesion on his hip, and quietly begins to lose his mind.As parents and children fall apart and come together, Haddon paints a disturbing yet amusing portrait of a dignified man trying to go insane politely. After reading The Curious Incident of the Dog in the Nightime by this author, I was intrigued to read more of his books. I picked this contemporary one up because it follows the multiple perspectives of different family members as they all experience big changes in their lives. 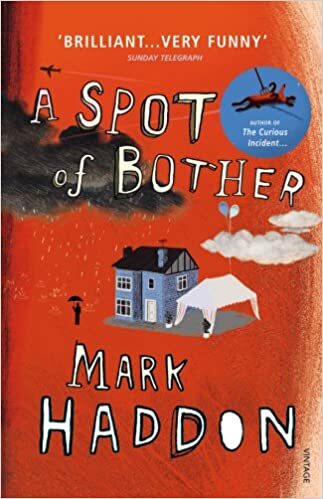 It's humerous, light-hearted and a realistic depiction of a normal family life, including the good and the bad. I really enjoyed the use of multiple narratives as a structural device because it gave us as an audience an insight into all the family member's different thoughts and opinions of events. This worked really well with this story line because there was so much happening to all of the characters as a family and in their personal lives so it helped separate them from each other, whilst connecting them at the same time. The plot was quite unexpected actually. I wasn't expecting a lot from the novel since the blurb made it seem like your average read for when you're in a chilled out mood and don't need anything too heavy. Yet as I was reading it there were a lot of twists that I weren't anticipating, especially surrounding the characters George and Katie. The ending concluded on a happy note (for some anyway) which I was really pleased to see. I certainly wasn't disappointed! As for the themes in this book, such as relationships and family, I think they're so important but aren't spoken about in modern novels as much. This reminded me a lot of my own family because we all get along and have hilarious moments but there are of course arguments and disagreements. The fact that Haddon didn't just focus on the positives enabled him to illustrate a realistic family lifestyle. Overall I would definitely recommend this to adults (and mature children/teenagers) who need reminding the importance of family and how they're always there to support you even if they disagree with what you do (especially then!) After reading this I realised how much I took my own family for granted and am determined not to let this happen again. And it occurred to him that there were two parts to being a better person. One part was thinking about other people. The other part was not giving a toss what other people thought. What they failed to teach you at school was that the whole business of being human just got messier and more complicated as you got older. The secret of contentment lay in ignoring many things completely.